The Road Traffic Bill 2013 was signed into law on 25th February 2014 and is now known as the Road Traffic Act 2014. Roadside impairment testing, where Gardaí can carry out cognitive tests to establish if a driver is under the influence of an intoxicant. The result of the test can be used if a prosecution proceeds. A new Road Traffic offence of tampering with an odometer (clocking) with a penalty of €2,500 and/or three months in prison. When a person flees the scene, with intent to escape liability, and does not offer assistance, knowing injury has been caused, €10,000 and/or seven years; where death results, €20,000 and/or ten years. Other offences such as non-display of an NCT certificate, which at present involve a Court appearance, will attract 2 points on payment of fixed charge. Taking a blood specimen in hospital from a driver incapacitated following a road traffic collision. The permission of the treating doctor will be required before the specimen can be taken and the results of the analysis will be revealed only when the driver can, subsequently, give permission. Requiring learner drivers to produce a log book indicating that they have taken a minimum (to be specified in Regulations) of accompanied driving experience before taking a driving test. This is in addition to the 12 formal lessons with approved driving instructors already required. Learner permit holders driving unaccompanied and or failing to display an L-plate will now attract two penalty points for each offence. PARC members met with Minister Varadkar on several occasions and requested changes in law. Existing offence and penalty for non-display of an L- Plate moved from secondary to primary legislation in the Road Traffic Bill 2013. Failure to display an L plate will result in 2 penalty points on payment of fixed charge or 4 points on conviction. Existing offence and penalty for driving unaccompanied by a qualified driver (with 2 years full licence) moved from secondary to primary legislation. Failure to obey this law will result in 2 penalty points on payment of fixed charge or 4 points on conviction. Learner log book. Onus will be on a learner driver to ensure that this book is filled out each time he/she drives with an accompanying driver and ensure that the times of the experience are signed off by their accompanying driver. The learner will be required to produce the logbook when presenting themselves for the driving test. Penalty Points. Learners to be automatically disqualified for 6 months after accumulating 6 penalty points on their licence. Arresting powers of An Garda Siochana- a member of An Garda Siochana may arrest a driver found to be driving while disqualified and then bring those drivers under the mandatory alcohol testing regime. This rectifies the current situation in which there is no power of arrest relating to drivers found to be driving while disqualified. The Road Traffic Act 2011 provides for the mandatory alcohol testing of drivers involved in road traffic collisions where there is death or injury or where injury is claimed. From 1 June 2011 Gardai attending a fatal or injury related crash must test all surviving drivers involved unless such a test would be prejudicial to that driver’s health. Where a driver fails the preliminary test at the scene, he/she is taken to the Garda station for an evidential test to be conducted which will give the exact alcohol level. In circumstances where to take an evidential sample would be prejudicial to the health of the driver, and the driver attends hospital, the Garda must request a test be carried out by a doctor/nurse. The medical doctor treating the driver may refuse such a test should they decide it would be prejudicial to the health of the person. This legislation does not allow for the testing of an unconscious driver but a provision has been included in the Road Traffic Bill 2013. Note: Professional drivers, learner drivers and those who are newly qualified are subject to a lower 20 mg drink driving limit since 2010.If the Garda forms an opinion that a driver has consumed an intoxicant but he/she passes the alcohol test then a test for drugs may be carried out. All fatalities are tested automatically for alcohol and drugs including medications as part of the post mortem examination - under Coroners Law. 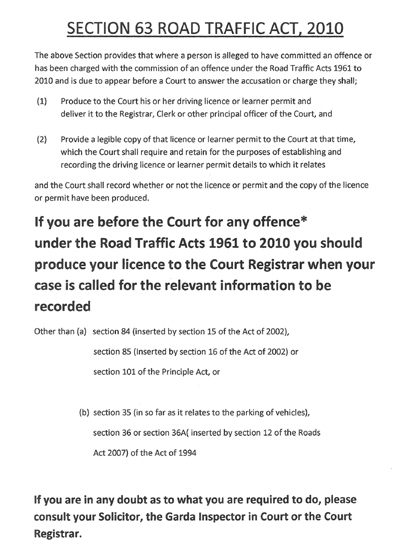 This court notice informs motorists of the new law requiring drivers convicted in court to produce their driving licence and a photocopy to the court clerk, on the day, for the purpose of having the driving licence number recorded. If a driver fails to produce his/her licence to the court they are guilty of an offence resulting in a fine of up to €1,000 for a first offence; €1,500 for a second offence and €2,000 for a third or subsequent offence. See below exact copy of the notice which is found in the court.